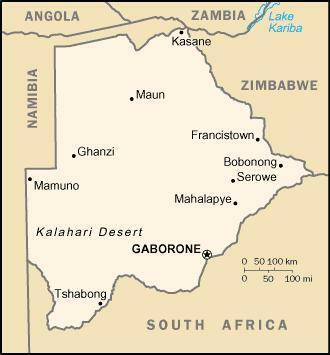 Gabarone is the capital of Botswana located in the South of the country near the border with South Africa. Gabarone is the place to organise your stay in Botswana. The 1300 km Okavango river meanders and forms lagoons, channels, swamps and islands and is host to scores of birds and wildlife. Access it from Maun; a tourist-friendly town with it's amenities and excellent roads. Chobe, Moremi and Savuti are all on the edges of the swamps with breath taking game viewing. The terrain is varied - Savuti is flat and is known for it's buck and elephant viewing while Moremi has dry grasslands, wetlands and mopane woodlands. Chobe boasts the most varied wildlife in Botswana. As they are all situated near the marshlands the water levels do get high in the rainy months often leading to closure of the gates, usually during the summer months of January to March - something to be kept in mind when planning your visit. The terrain also lends itself to 4x4's rather than 2wd's. The Sua and Ntwetwe saltpans make up the Makgadikgadi and are believed to be the largest in the world. The mud is saturated in salt and shimmers in the sunshine and the moonlight taking on a surreal personality of it's own. This is a desert island in the pans that is strangely prehistoric with its baobab trees. It can be accessed by 4x4. Here you will find flocks of flamingo, pelicans and other waders. The grassy plains should not be missed during the rainy season when there is mass migration. This Sanctuary is relatively new and lies near Sua Pan. The variety of bird life is a must for bird watchers and nature lovers alike. The Sanctuary is over 200 square km in size with buck and other wildlife too. There are over 200 sites with about 3000 San Paintings that you can visit in the four hills known as the Male, Female, Child and North Hills. These bushmen paintings have been frequented by Prince Charles and Sir Laurence Van Der Post who called them the "Mountains of the Gods". Find more information on the Kalahari by visiting our page on the Kalahari Transfrontier Park. This country has such a variety of bird life and other wildlife you will certainly get to see it all. Be sure to know where the access gates are and the times of opening and closing. It may also be advisable to use a 4x4 as a preferred mode of getting around. Game and bird watching are always at their best at sunrise and sunset. There are organized tours that will ensure that you get the most of your trip - whether it be under the heat haze of the day or under the twinkling stars at night. No, we don't mean literally but we do recommend that you watch out for the elephant herds in the Chobe National Park. Get in touch with nature and camp on Kubu Island or in the Natu Bird Sanctuary - weather permitting of course. During the rainy season the animals migrate in huge groups - particularly dazzling on the Nxai Pans. This is a form a transport for the locals known as Mokoro - "wooden canoes". Take a peaceful meander and enjoy the surroundings on the waters of Botswana. Similar to the fare in South Africa - see our section on "What to eat". You can find excellent hotels and lodges in Botswana. Many of the main hotel sites will have listings for you. Find Botswana Hotels. There are quite a few hostels in Botswana. Prices vary from hostel to hostel but are generally affordable. Search and book a hostel in Botswana. There is an international Airport in Gaborone although it may be cheaper to catch a connecting flight to Botswana from Johannesburg, Harare or Windhoek. It may be handy to remember that there is an airstrip in the Okavango Delta for small planes. 4x4's are recommended if touring Botswana. There are also overland trucks mainly used by tour groups. You can also rent a car and drive along the more developed roads and leave the rally driving to the professionals. It is possible to catch a train or bus on the main routes. These can be slow though and there are no bus routes through the Game Reserves. The population of Botswana is comparatively small to the rest of Africa and indeed to other countries of the same size. The infrastructure is good and the education and health policies are on a par with South Africa. The locals take pride in their country and will go out of their way to share some of it's richness with you. In addition, Botswana has a National language and this is Setswana. GMT +2 during the northern hemisphere fall and winter months and GMT +1 during the spring and summer.